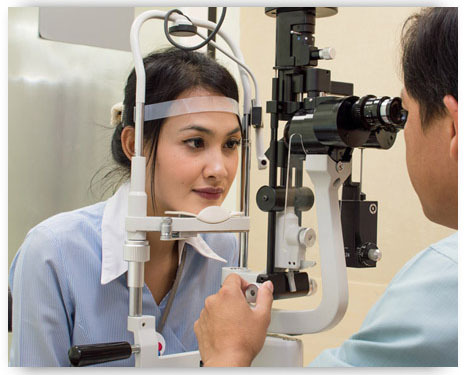 A general or routine eye examination can help you to treat and prevent many eye diseases and eye conditions. Unfortunately, people often neglect their eyes and may not be aware of a host of eye diseases. Just because your eyes are not in pain does not mean that your eyes are healthy. Also, people’s eyes often change very slowly, which can make it hard to detect. Often during a routine eye exam, our patients are surprised how much clearer their vision can be made. In general, the earlier a potential problem is diagnosed, the better the prognosis for treatment. Our general or routine eye examinations are exceptionally thorough and are a comprehensive checkup of the entire visual system and overall eye health. The eye examination allows us to determine what type of vision correction is best suited for each individual patient. Your ability to see clearly at different distances will be tested to determine a proper prescription for glasses and or contact lenses. 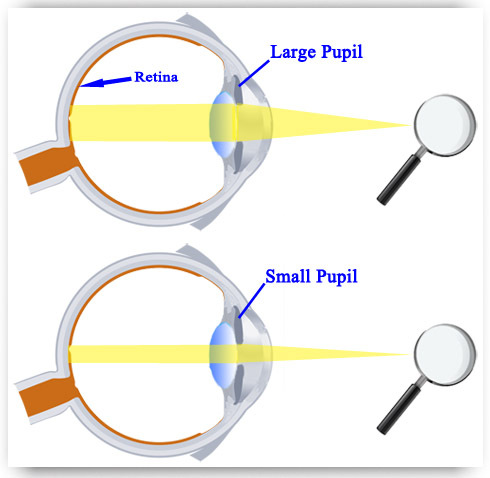 This includes the measurement of a visual acuity, and a computerized assisted measurement of your refractive error. Your specific visual problems and needs are taken into consideration before the final correction is determined. Autotonometer– Measures the intraocular pressure (important for Glaucoma detection and monitoring). The automated version for measuring eye pressure is less invasive, painless and faster than the “blue light test”, used by our competition. A thorough eye examination should include a dilation, autorefraction, auto tonometry and the option for checking your peripheral vision via automated perimetry testing. When the pupil is dilated it is easier for the eye doctor to check the health inside of the eye during the routine eye exam. In the picture above, the pupil that is small and undilated demonstrates how the view of the observer is constrained. Have you ever waited for 1.5 hours to get a routine exam done? This will not happen with us because our enhanced automation.When it is so simple to screen, diagnose and treat an eye problem, shouldn’t you take some time to check your vision before it begins to become a problem? People often ask us, “how often should i get a routine eye exam”? People without any vision complaints are recommended to get examined once per year. Obviously, if you are noticing any other changes in your vision and have complaints or concerns, you should seek eye care immediately.